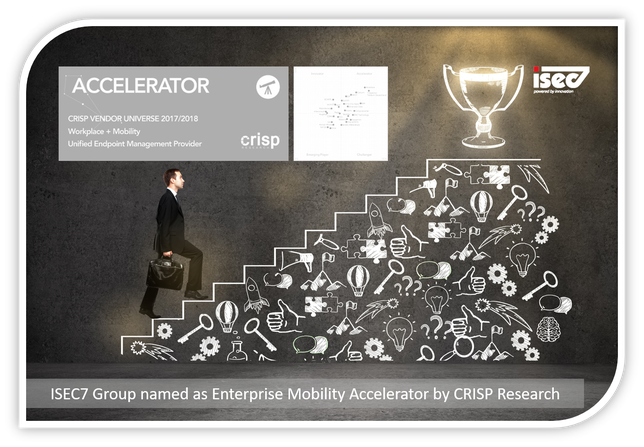 ISEC7 Group (ISEC7), enterprise mobility expert from Hamburg, is one of the best service providers for enterprise mobility transformation & service according to the independent IT research and consulting company Crisp Research AG. In its current report “Crisp Vendor Universe, Enterprise Mobility Supplier and Service Provider”, ISEC7 is positioned as an accelerator in the market - with its combination of partner solutions and proprietary applications. Thus, ISEC7 is the study’s leading distinct EMM solution provider. Divided in two main categories, “Vendor Performance” and “Service Value Creation”, Crisp Research analysed the provider’s strategic focus in the respective market environment, its strategy, the number of partners and the collaboration with them. Furthermore, products as well as service offerings were assessed – from the spectrum of the provided services through to the usability of the single product. Being one of the few providers, ISEC7 combines several of its partner solutions in an enterprise mobility framework. The platform consists of different partner suites’ modules and ISEC7’s own add on services like the ISEC7 EMM Suite. In a hosting model, these can be controlled from a high-secure computing center. Moreover, ISCE7 offers several apps and services in the area of mobile working – e.g. on the basis of SAP – as well as integration services for Office 365, which are completed with ISEC7’s range of services. With a team of experienced analysts, consultants and software architects, Crisp Research identifies and evaluates the relevance and disruptive force of digital technologies as well as its providers. The “Crisp Vendor Universes” supports companies in selecting technologies and providers with a clear estimation of strengths and weaknesses. A transparent methodology, independent research and proprietary implementation skills are the basis for comparing providers and products.